Alhaji Aliko Dangote, President, Dangote Group, says his investment in the sugar sector will place Nigeria on the global map of sugar producers while increasing employment and saving huge foreign exchange for the country. Dangote said this on Monday in Lagos during the 2018 Dangote Customers Celebration and Food Distributors’ Award Night, organized by Dangote Foods. The News Agency of Nigeria (NAN) reports that Dangote Foods, comprises of Dangote Flour Mills, Dangote Sugar Refinery and NASCON Allied Industries. He disclosed that the company invested massively in the sugar sector across the country in line with its Backward Integration Project targeted at the production of 1.5 million metric tonnes per annum of refined sugar in the next 10 years. Dangote said that the award was to appreciate customers and distributors who through their dogged and persistent efforts had made Dangote Foods products a household name in Nigeria. “You are all aware that we are celebrating 2018 against all odds. Our Food businesses recorded mixed results in the year with NASCON growing while Dangote Sugar Refinery and Dangote Flour Mill had a very difficult year. “Fluctuations in performance are known to occur in the life of businesses but the greater part is that you persevered with us. This underlines our theme of ‘Better. Stronger. Together’. “My special commendation goes to Dangote Sugar and Pasta customers who, despite the price challenges posed by influx of unlicensed and substandard grey imports stood by us. “We have remained the dominant brand in most of the sectors where we play in the food sector, and we are delighted to have you as our partners through thick and thin,” he said. Dangote said that the challenges would soon become history as investment in the sugar sector would soon create between 75,000 to 150,000 jobs, price reductions and improved profits to customers. He commended the customers for enduring the Apapa gridlock that caused delay to product delivery and increased cost to business. “To reduce the traffic gridlock, we invested significantly in the Apapa road reconstruction project and the completion in 2019 should bring massive relief to our three food companies as well as our competitors operating from the axis,” he said. He recalled that in 2018, he disclosed plans for new investments in NASCON Allied Industries aimed at boosting efficiency and better returns. “Today, NASCON, after a strong 2018, has continued to roll out several culinary innovations such as curry, stew mix, soup mix and different seasoning flavors to satisfy consumer demands,” he said. The industrialist noted that Dangote Flour Mills had a four-prong strategy – expanding capacity, innovating to attract more user groups, upgrading capabilities and enhancing product portfolio. Dangote said that the company’s goal for 2019 was to continue to delight its customers, bakers, confectioners and consumers all over the country, saying it would result in stronger growth and sustenance of all its business units. He said that the company’s investments which includes the $12 billion Ibeju-Lekki refinery projects would address Nigeria’s agriculture and energy needs. NAN recalls that Dangote had invested over N400 billion in sugar backward integration projects under the Nigeria Sugar Master Plan (NSMP) being implemented by the National Sugar Development Council to drive the attainment of self sufficiency in sugar production in the country. The Overall National Best Performing Winner for the award was Alhaji Ali Balarabe, who had won the award for three consecutive years. 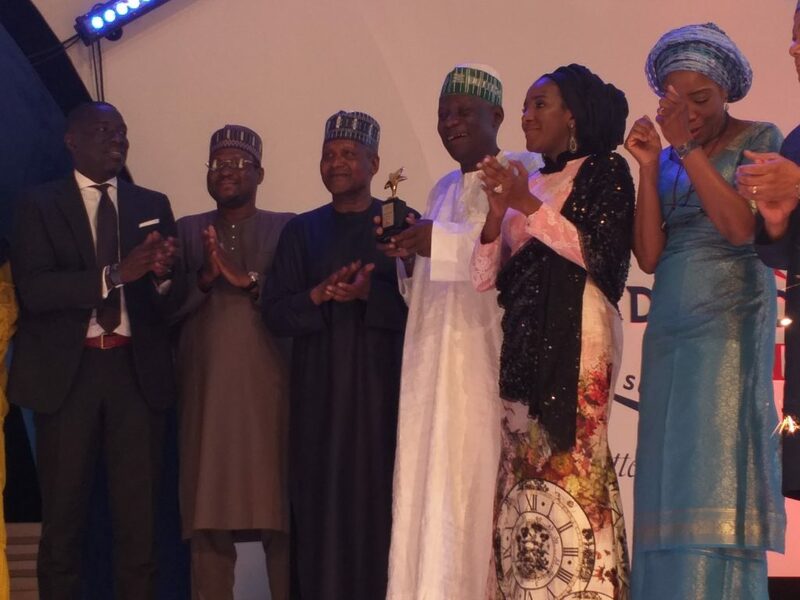 Recipients for the second place Best Performing Customer Other Category (National) are; Sabo Dankoli (NASCON); Abdulwahab Shagumba (Dangote Flour); and Felicia Modupe (Dangote Sugar).